It sure does not seem like 7 years has passed so quickly but it certainly has. The bike has been a joy and we have ridden it almost 38,000 miles since we got it back in May of 2011. The frame, fork, headset and front eccentric are original however I did add spacers to the rear dropouts in order to change the rear spacing from 145 to 130. Everything else has been upgraded or replaced over the years. We have not had any real issues with the bike, the changes upgrades were made to improve/enhance the riding experience. We did have to walk one time when we had 2 flats because of a bad tire that I should have replaced. The most significant change occurred last July when I added a PAS electric motor. 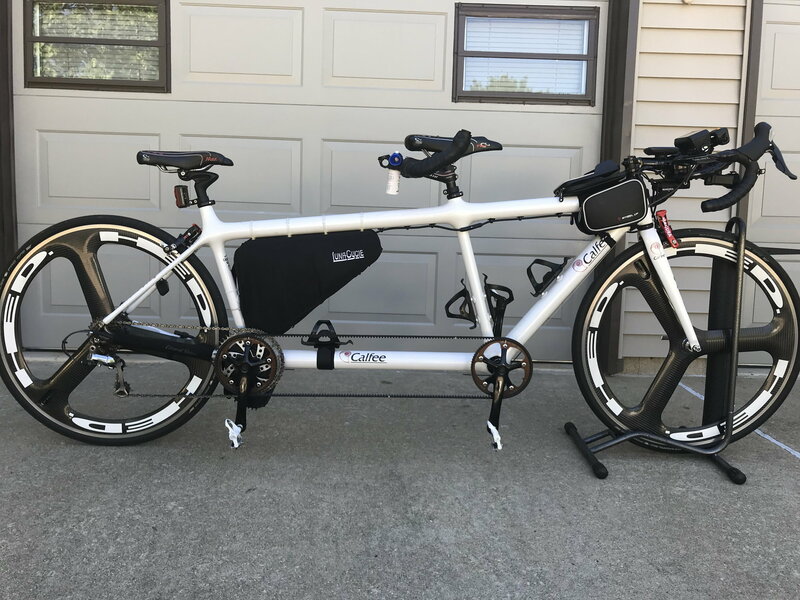 Our tandem is now and E-bike and we LOVE it. I installed a Bafang BBSHD motor to the stoker bottom bracket with the technical assistance and support of Rob at Calfee. I also installed Magura hydraulic rim brakes, new old stock. I am also running Schwalbe One 700 X 28 tubeless tires on HED 3 wheels. The only significant component failure we have had happened recently, the rear Shimano 6700 brifter failed, something inside broke and it would not down shift, when I took it off pieces actually fell out. I would highly recommend the Calfee Tetra tandem, we plan to keep this one for several more years. The only thing that would change that is if Calfee built a frame that actually incorporated an electric motor. Good to see we are not the only ones to go etandem! A year ago we bought a Circe Helios, with Shimano STEPS and Shimano Di2 Alfine hub gear and love it. We still use our Macchiato, but if there is a hint of hills, like this weekend's GTR, out comes the Helios. With a combined age of 155, why suffer? Do you have a photo of your e-Calfee? Here are a couple of pictures that I took today. Thank you, Wayne. A very neat installation. A fearsome-looking machine!! Makes we wish I had kept my impulse-buy Cannondale T2 and converted it, but I would have had to have bought a van to carry it. The Helios comes apart and I shove it into the back of the Volvo. Hey, He showed you his, shouldn't you return the favor? We don't have nearly as many miles or years on our Calfee Tetra. We got out on it yesterday after a few weeks off of it. I get used to my Specialized Roubaix single. When I get on the Calfee, I forget how smooth and plush the ride is compared to my single. Great bike. Nice Calfee e-bike....where did you purchase the seat posts? Who makes the water bottle carrier on the bottom tube? What is mounted on the front of the handle bars? Will this bike be at MTR this year? 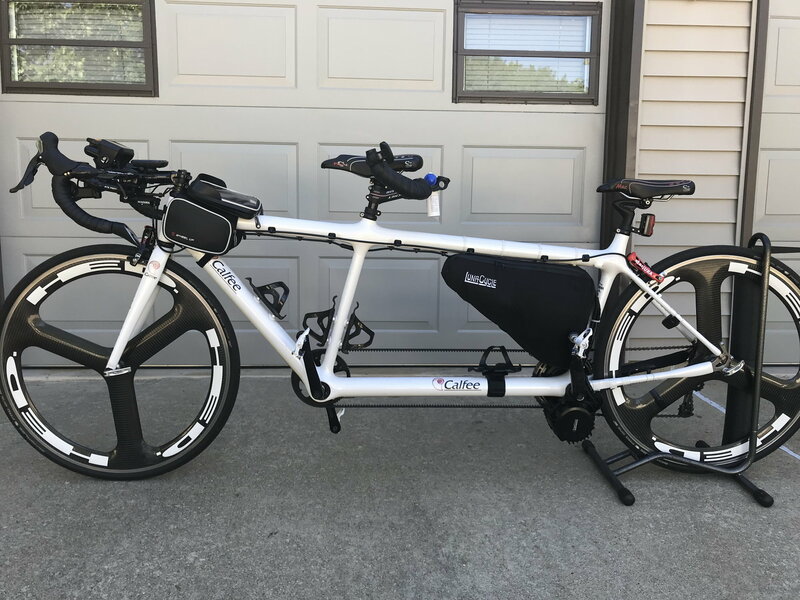 I found the rear seat post on EBAY, it is a specialized product. The display and control for the motor. We will not be at MTR. We live near Champaign, Illinois, you are welcome to stop by and check it out. PM me if interested. So back in 2009 you were planning on keeping the Tetra tandem a few more years..... Still have it? My wife and I are in the market. Mike, exactly what are you asking? The bike is not for sale. We are still very happy with it.